The DH165A0 is set up at the factory to control six function outputs. The DH165A0 is configured to control the forward-headlight F0F/white lead and reverse-headlight F0R/yellow lead for directional lighting. These two headlight function leads are current regulated for LEDs or lamps, with factory setting of approx 15mA, with no resistors required. 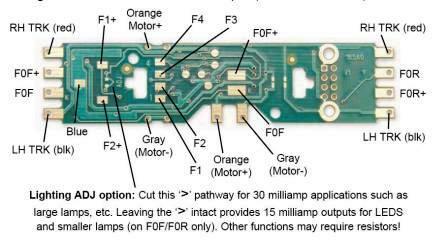 Cut the ADJ link to increase headlight current to approx 30mA (see figure below). Functions F1 (Green), F2 (Violet), F3 (Brown) and F4 (White/Yellow) are full track voltage and can be used by soldering a wire from the pad for the function you wish to use to the lamp (or other function) you wish to control. Use the Blue (common) pad just behind the FOF and FOF+ pads for the return connection.